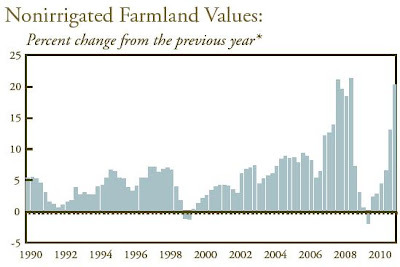 Back in the early days of this website, as I thought out the "long term" in terms of economic, demographics, urbanization, etc trends, I mentioned arable farmland as potentially the best long term investment (talking decades) I could think of. Shortly thereafter I heard similar thoughts from legendary investor Jim Rogers - his infamous quote now is something along the lines of "today the bankers drive Ferraris, in the future farmers will." (with the state of our captured regulatory bodies and Federal Reserve, I don't ever foresee a day bankers won't be driving Ferraris!) Of course this is not an easy thesis to play since there are limited investment opportunities short of a few niche hedge funds, and a few land oriented stocks (mostly foreign). But, there are second derivative trades such as investing in "heartland" centric themes, or companies who benefit most from the new found wealth of the farmer class. "With robust farm income, farmland values posted sharp gains akin to the swift rise in 2008. 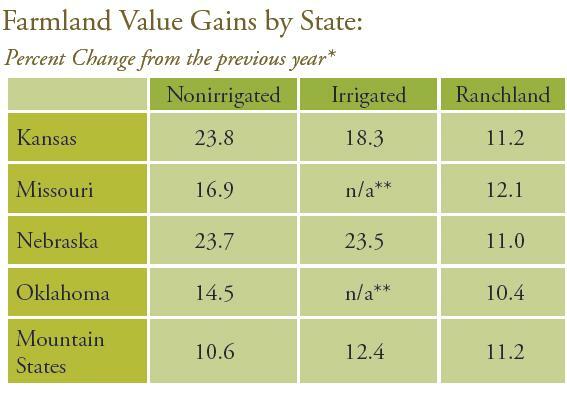 Across District states, cropland values surged 20 percent above year-ago levels, particularly in Kansas and Nebraska. Bankers also reported a sharp jump in cash rental rates that echoed the rise in cropland values, especially for irrigated acreage." First, year over year gains in Q1 2011 - you can see Kansas and Nebraska on pace for doubling of nonirrigated farmland in 4 years at current pace. Here is the long term chart on a quarterly basis - one can see the explosion over the long term trend starting in 2007.